Daffodils are one of the earliest signs of spring. I’ve planted hundreds over the years and every year is more exciting than the last. 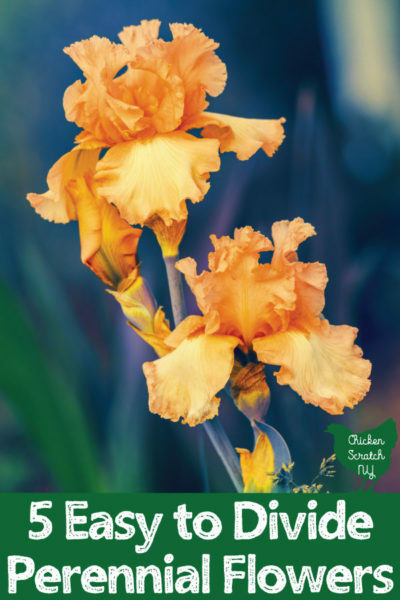 There are dozens and dozens of daffodil varieties available for a stunning spring flower show. There are so many beautiful daffodil varieties that I could never pick just one. I have them planted all over, in the orchard around the trees, under the grapevines and scattered all over my front lawn. To be fair, the last option isn’t the greatest. My front lawn gets really wet and the bulbs never took off the way I wanted them too. That’s what you get for going all in with a planting local before you’ve lived a full 12 months in a spot. I’ve been slowly digging them up and moving them to better locations over the years. I prefer to plant a mixture of daffodil bulbs for a few reasons. It’s so much cheaper to buy a massive bag of 100 bulbs. At the same time I love chaos in the flower bed so a mix of daffodil varieties makes it possible to break up the ‘sameness’ you get with 100 of something. 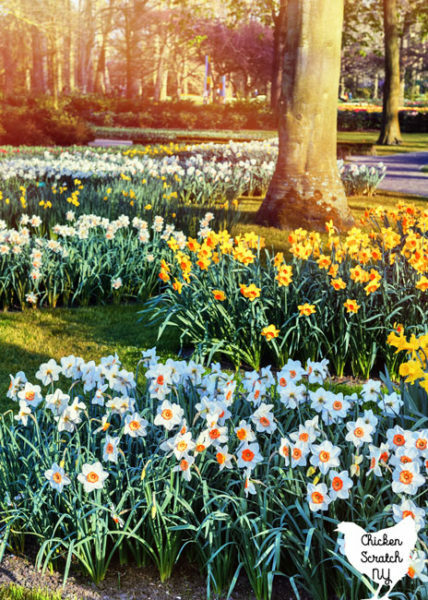 Another check in the pro column for planting a variety of different daffodils is the longer blooming season. 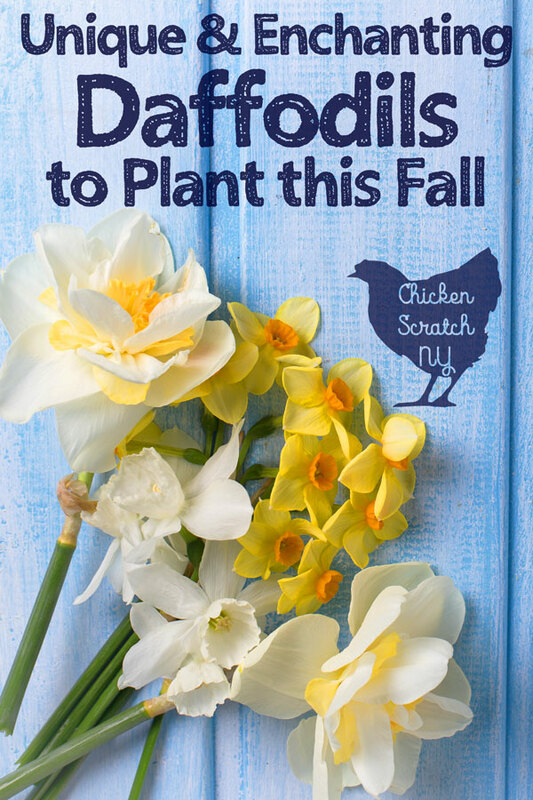 If I plant 100 Minnow daffodils (they’re my favorite!) I’ve got one crazy impressive flower display. And then it’s over for the year. But if you mix in different types you can have a more prolonged flower show. Daffodils are spring bloomers but you actually plant them in the fall. My preferred method is to grab a shovel, dig up a shovel-sized chunk of lawn, drop in a few bulbs and place the dirt back. I have 9 million earthworms and they do a good job getting things knit back together. I wanted to share some of my favorite daffodil varieties. While I absolutely love a mob of traditional yellow flowers I’m going to leave those off the list and get to the fancy stuff. Daffodils are officially organized into 13 divisions. The American Daffodil Association has a great breakdown of the divisions. You’ll notice my break down is a little bit different. While I do have some of the divisions listed I’ve added a few of my own. I don’t think the technical differences are really that important to the average gardener. I know I care more about the unique colors, shapes and the combinations of those than the specific ratio of perianth to corona (petals to cup). 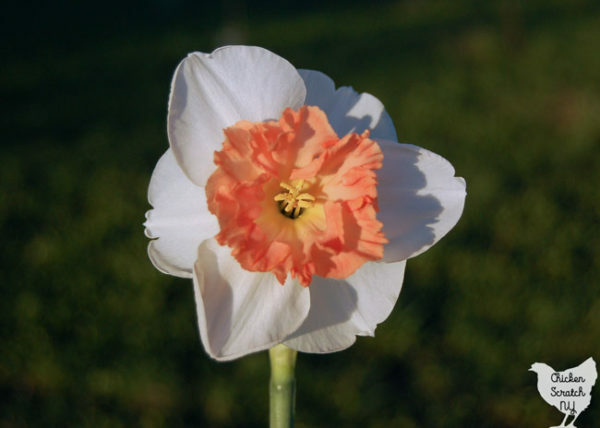 You can find fragrant double daffodils or split cup pink daffodils, etc. It’s a wide world of flower bulbs! Small cup daffodils have, you guessed it, small cups. The flowers themselves are the normal size. The center ‘cup’ is less than 1/3 the length of the outer petals. 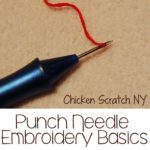 The little cup gives them a delicate and dainty appearance. 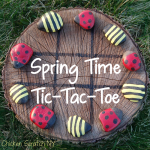 They’re available in many color varieties that over lap into some of the other categories I’ve got listed below. I think they look best when the center cup color stands out from the back petals. 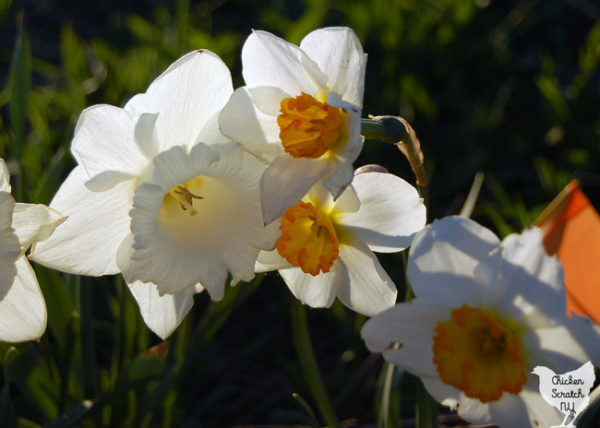 When you hear daffodil you automatically think yellow but I think white daffodils are stunning. They range from completely white to a mix of half white – half yellow (or pink, or orange). I have several different types but my favorite are the large cupped single flowers. They remind me of tea cups for some reason, a large cup on a dainty saucer. That has to be from a cartoon, any ideas? Tiny flowers are pretty too! Miniature here is about the plant and flower size. You have quite a few options in the world of miniature daffodil varieties but they all have a small stature in common. 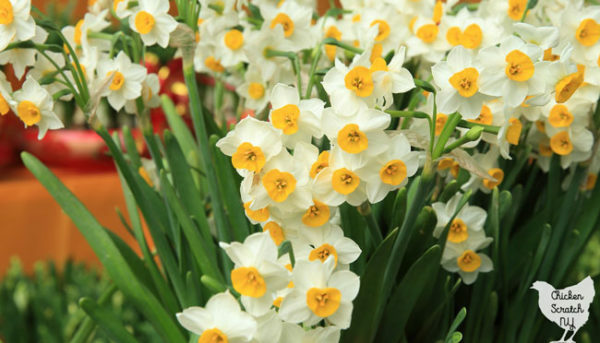 Miniature daffodils range from 4-8 inches tall with small flowers. 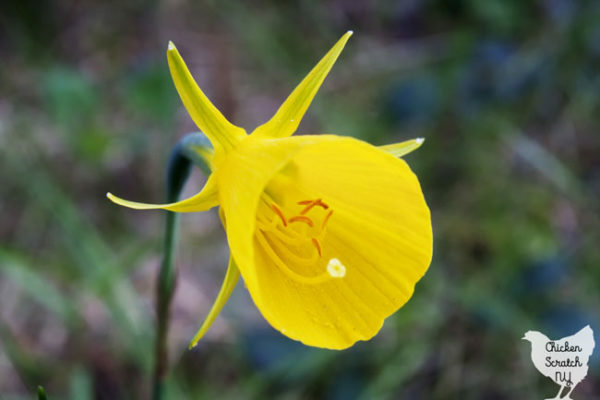 You’ll find a lot of species or wild type daffodils fit into this dainty size category. One of my favorite things about miniature daffodils are the multiple flowering varieties. Not all miniatures have multiple flowers but it’s more common among the little guys. I’ve noticed my minis bloom later than the others even though they’re all planted together. Did you know you could get pink daffodils? To be fair it’s not a neon pink, more of a coral. But still unexpected from a flower synonymous with yellow. There is a trick to getting the most from your pink daffodils and it comes in during planting time. 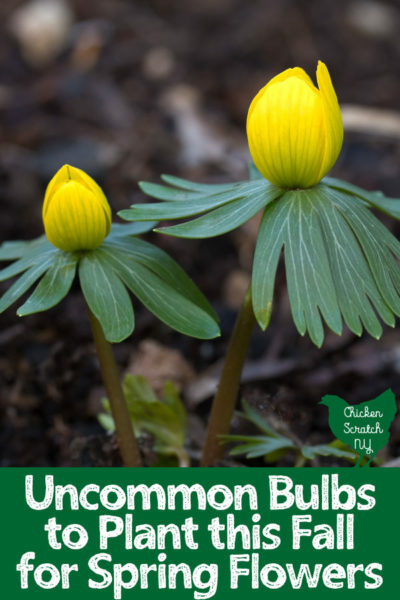 You’ll get the pinkest color if you plant your bulbs in part shade or filtered sunlight. Take note of where you get filtered sunlight during the day before you plant. Remember that the trees won’t be fully leafed out when the daffodils are blooming so full shade in the summer might be just what you’re looking for! I get all my daffodils in random mixes so I’ve got pink flowers all over. They look pretty every where but they are visibly pinker when they’re out of the full sun. This category covers a wide range of daffodils. 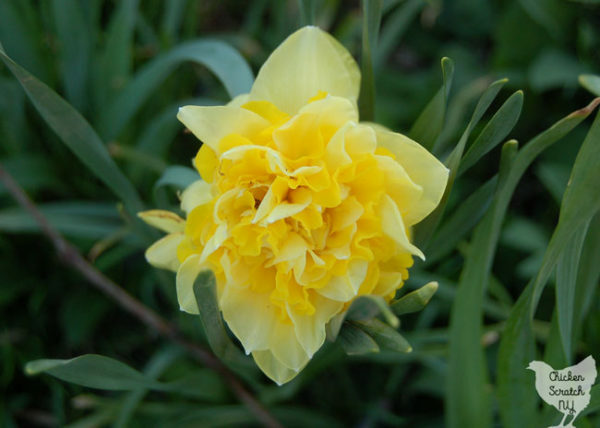 You can find fragrant daffodils in just about any category. Just like my daylily garden I don’t plant daffodils for the fragrance but it’s a nice touch. It’s spring after all and I want my whole world to smell like lilacs. 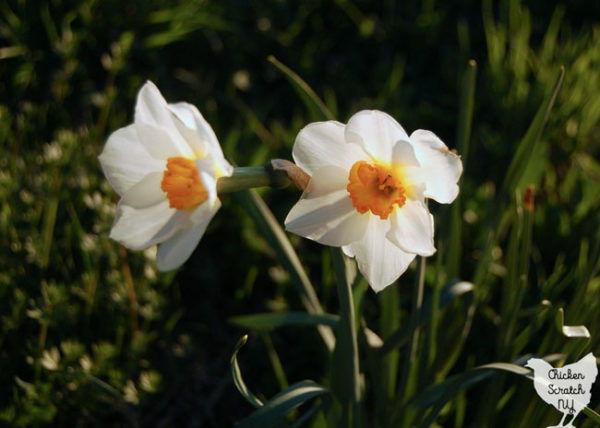 Going back to those official divisions, there are several divisions of daffodils known for fragrance. They include Poeticus, Jonquilla and Tazetta Narcissi. Split cup daffolils are some of the pretties flowers around. The inner cup is split, looking like multiple petals. Double Narcissi are real show stoppers! They’re stunning flowers, they seems to have an impossible number of flower petals densely packed into each blossom. Double rows of petals leave the blooms looking more like peonies than daffodils. Depending on the variety you can have a single color like the one shown above or a twisted mix of two tones. The daffodils in this group get their name from the resemblance to Cyclamen flowers with recurved petals. Unlike some of the catagories this one is based on biology and breeding not just a color or size. 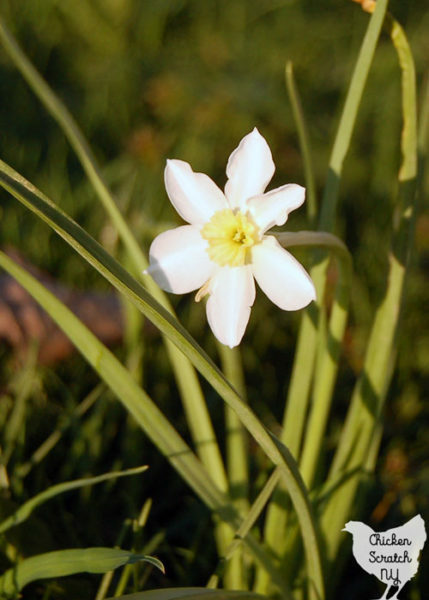 Species Narcissi are the original, wild-type daffodils. I grow a lot of species tulips but I haven’t planted any of the daffodil counterparts yet. 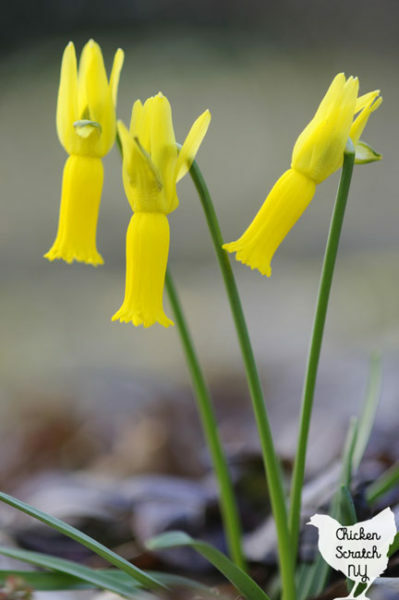 I’ve got my eye on the somewhat crazy looking Narcissus bulbocodium to plant this fall. They’re short, 6-8 inches tall and I’m going to plant them in clumps along the border of my front flower bed. 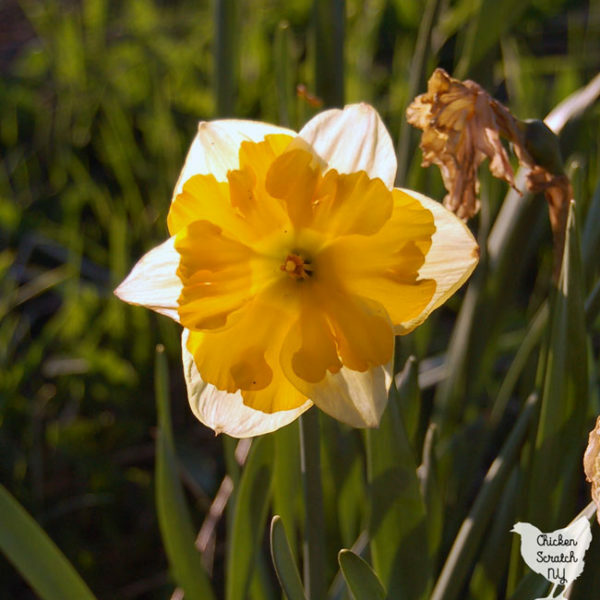 Do you grow any daffodil varieties in your garden? I’m still planning out my fall bulb order but I know I’m getting a few of these to plant this fall.